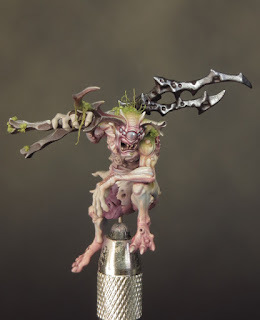 I’ve been painting minis for the best part of 37 years now and I get the same pleasure and satisfaction from it at the age of 51 as I did when I started at 14! I like to think that, as I’ve grown in experience, I’ve been able to develop and refine my technique to the point where my painting skills are the best they have ever been. However not everything gets better with age alas! 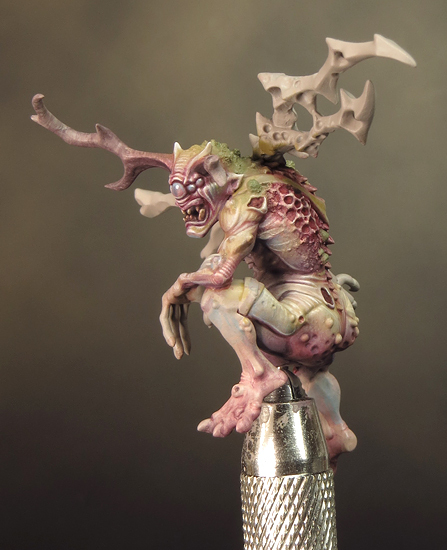 I’ve gradually been finding it increasingly difficult to hold focus on my minis as I paint them. 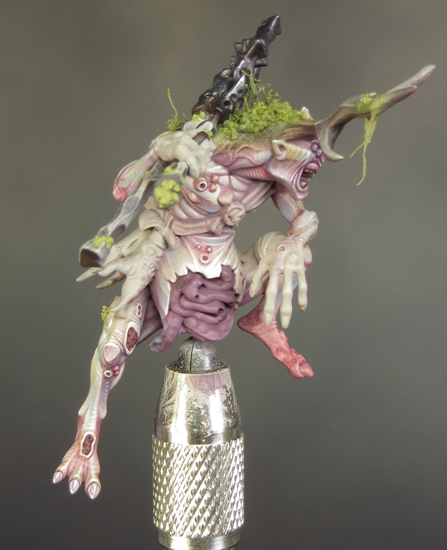 I first noticed it while I was painting my Plague Marine but recently it’s become a serious obstacle to my painting of Horticulous Slimux! Put simply after a short time painting my focus slips and I can’t see what I’m doing. Oh the joys of being middle aged! Thankfully the remedy is simple enough. I’ve had to admit to myself that I’m no longer 25 and get a stronger pair of painting glasses. Much relieved, I can now focus on the mini for long enough to refine the textures and colour transitions to my satisfaction. As a result of all this, and the fact that it’s half term, I’ve not made a massive amount of progress this last week. However I’m very pleased with what I have achieved. 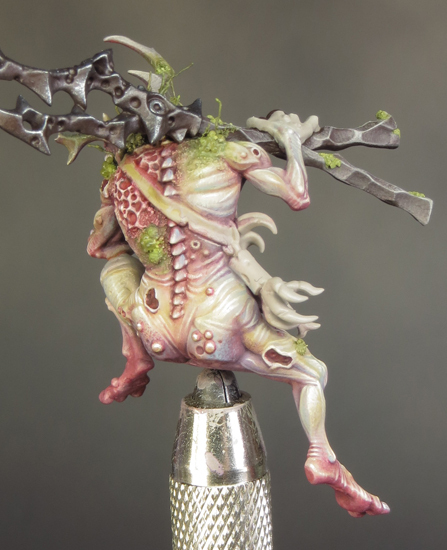 I’ve refined the green plant growth on Horticulous and painted the flesh tones on one of his legs. I’ve also been able, now I can see them, to go back and refine those areas I’d already painted. Although my colour palette is very different, my technique for painting the flesh tones is a more polished version of the one I used for my Plague Bearers. 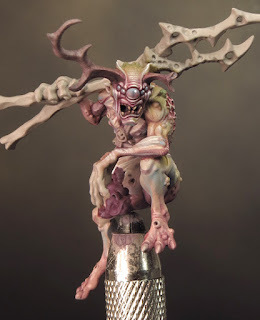 I paint a base coat of Rakarth flesh then I glaze over this with my mid tone and shade colours. These colours provide an element of saturation to the, otherwise neutral, flesh tones and glazing over a light base colour gives them a feeling of depth and luminosity. The result is colorful but messy. I then build my highlights up, with a series of dilute layers, over the glazed layer. These are created using my neutral flesh tones. Although I’ve used Ivory for the extreme highlights the majority of the highlighting is created using Flayed One Flesh. This has a warmer yellower tone than the ivory and gives a softer look to the flesh. It’s during the highlighting stage that I create the texture by building up areas of stippling and, in this case, wrinkles. At the same time as I build up the highlights, I glaze the red, yellow and blue tones back in, if an area becomes too pale or the highlights too harsh. This is a very organic process with a lot of going back and forth between glazes and highlights until I’m satisfied with the result. 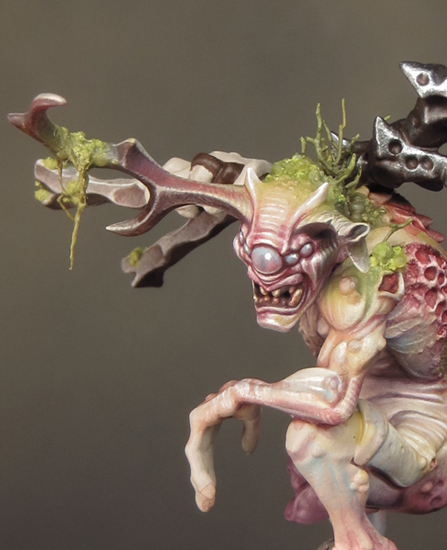 Coming back to the topic of eyes, I’ve had a lot of requests for a tutorial on Horticulous Slimux’s blind eye. But I’m not going to do one as such! The reason being that the technique really doesn’t merit it. 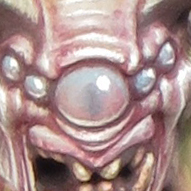 The eye was painted with very basic glazes of desaturated blue/grey and red/grey tones. The pupil was then glazed on with a darker grey tone making sure to keep it soft and undefined. The whole thing was then finished off with a strong white highlight on the top surface and a softer highlight along the bottom edge. The real secret to painting the blind eye was that I found good reference material. In the end an image of the old faun from the film ‘Pan’s Labyrinth’ gave me what I needed. The trick with using reference material is not to simply copy without thinking, but rather to study and then apply what you have observed to your mini. In the case of the eye, I looked at the overall colour and transparency of the eye paying attention to how the light reflected off the surface while also penetrating partway into that surface. I also studied the pupil and how it looked diffuse as a result of the cataract. 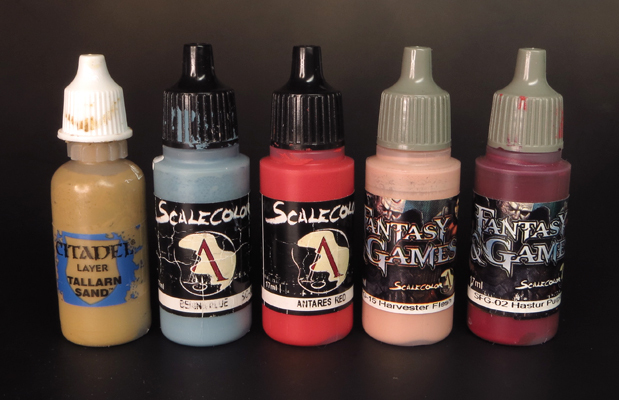 Using reference material to help inform you painting choices can make a huge difference to the final result. As I said in my first posting for Horticulous Slimux, I’ve sourced pictures of slugs, snails, frogs and caterpillars and I think they are going to be a great inspiration when I get round to painting Mulch! It feels like it’s been a long time since I got into a steady daily painting regime. But over the last couple of weeks, inspired by Horticulous Slimux, I’ve found my groove and established a productive routine! 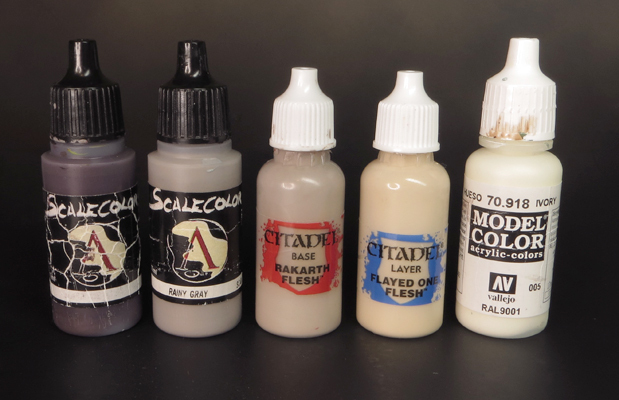 Last week I decided on a colour palette for the pale flesh tone I wanted to use. 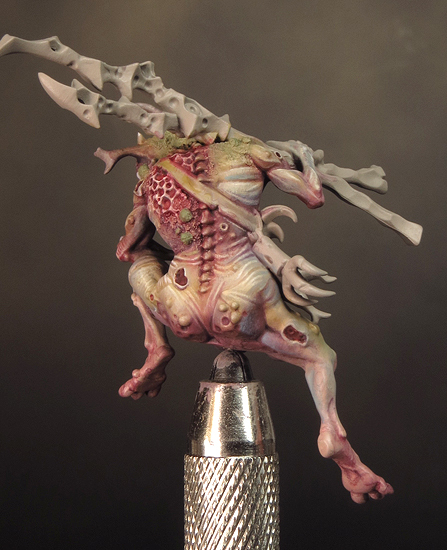 This week I’ve been adding some brown and green tones to compliment and contrast with the flesh. The use of the green plays a key part of my overal concept for Horticulous. As I said last week, I was inspired by the idea of him being old and a gardener. Both factors I want to incorporate into my paintjob. I hope his blind eyes and pale wrinkled flesh create a feeling of age. Although there are a lot of details on this mini that help to portray Horticulous as a gardener, I wanted to build the idea of Nurgle’s garden into my approach to painting him. In the past I’ve added crusty rough skin and nodules to my Plaguebearers. 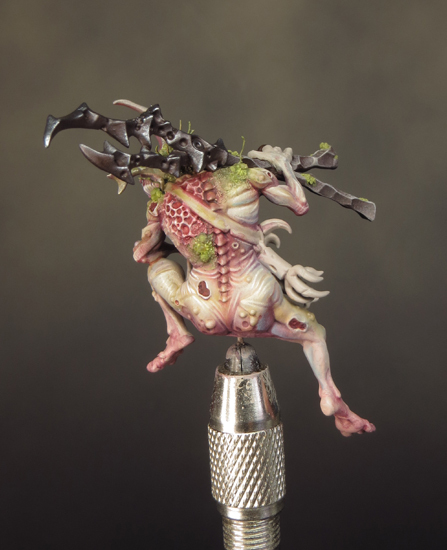 This time I’ve decided to elaborate upon the effect and add tiny plants and tendrils. I love the idea that Horticulous may be using parts of his own body as a nursery for some of the plants in Nurgle’s garden. I created rough, mossy areas on his neck and shoulders and then added tiny plant shoots into this texture. 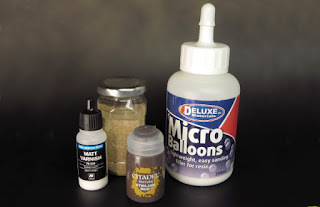 To make a texture paste I’ve used a range of materials. First of all I used Games Workshop’s texture paint Stirland Mud to create my initial rough texture. This was put straight onto the mini before I painted a base layer onto it. For a finer texture I used a mix of matt vanish, fine sand and micro balloons (used to bulk out and lighten resin) tinted with green paint. This fine textured mix was added onto the painted mini to create the mossy effect. Use only a very small amount at a time as a little can go a long way. Once applied to the mini I push it around with a clean damp brush. While this mix is not a perfect replacement for my once beloved bicarbonate of soda it comes pretty close. For the shoots sprouting out of his neck and shoulders I’ve used bamboo roots from my garden. I set up a production line and pre painted a range of roots prior to needing them. This gave me a range to pick and choose from. 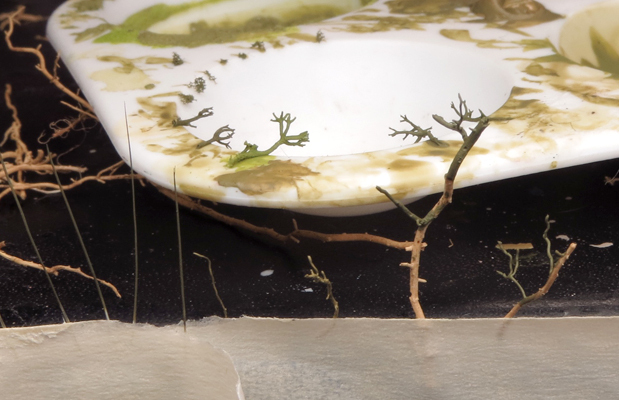 To apply them I cut the very tips of the painted roots with a scalpel and glued them into position with PVA glue and tweezers. This process is every bit as fiddly as it sounds! 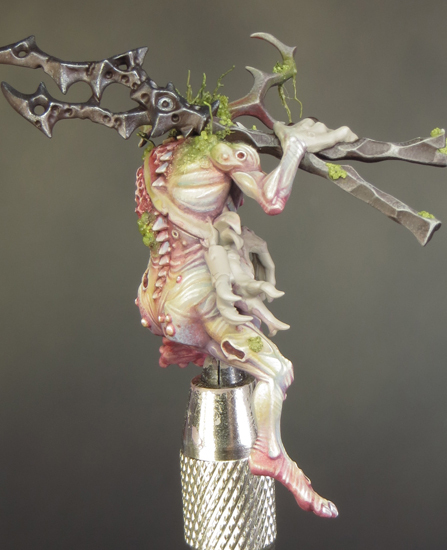 I’ve also added a few mossy growths to the handles on his shears. In addition to adding my fine texture paste, I’ve carved into the blades of the shears to enhance the corroded look of them. I used a scalpel to cut a series of notches and a drill to hollow out some corroded pits. Once I’d done that I brushed a little plastic glue over the pits and notches to soften up the cut edges and enhance the corroded look. The blades have been given a base coat, wash and highlight prior to some more detailed work with rust effects. 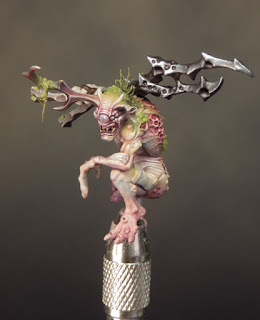 I’ve decided to use true metalics on Horticulous to further add to the range of material contrasts on this mini. 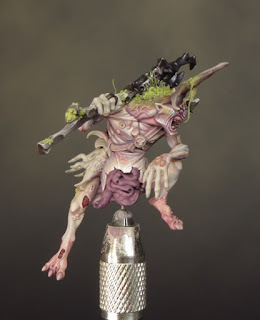 It seems like everybody is painting Nurgle minis at the moment. Which is no great surprise considering the recent glut of impressive new Nurgle minis. How could I ever resist! From the moment I first saw Horticulous Slimux I knew I was going to paint him. Every now and again a mini comes out that ticks all my boxes and this one does that to the max! 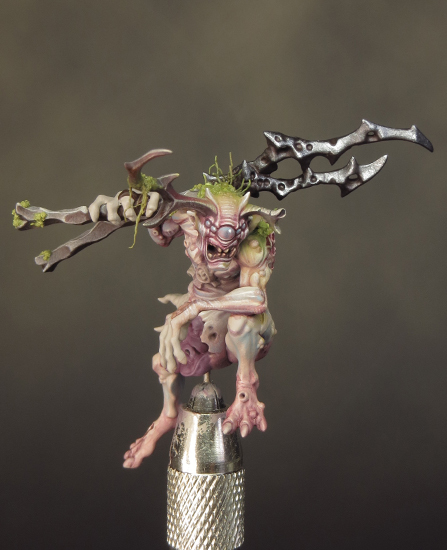 Games Workshop rarely releases minis with such a strong feeling of whimsy. That, along with the almost cartoon like styling and subject, give this mini a strong ‘old school’ feel. On top of all that he’s Nurgle’s head gardener and, possibly, the first ever Plaguebearer! 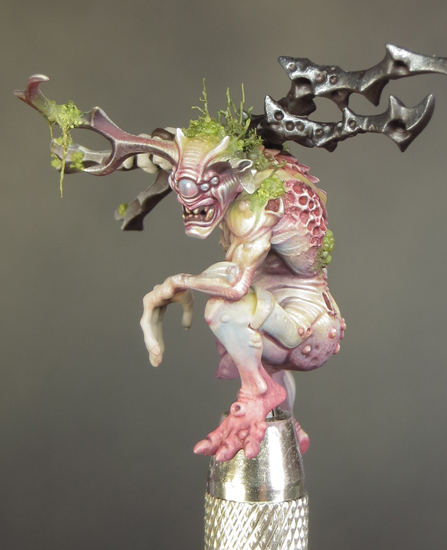 The last two details have given me lots to think about and inspired my approach to painting him. 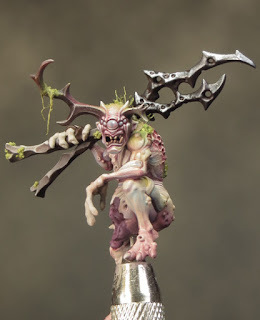 It would have been pretty straight forward to break out the forest green and paint Horticulous Slimux in the same way as my other plague bearers. But I had a nagging feeling that, for me, that would be too obvious an approach. 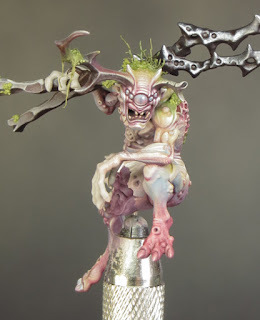 Horticulous Slimux is a significant character in the Nurgle pantheon and as such requires special treatment. He is a truly ancient being and I wanted to reflect this in my paint job. To put it simply, I wanted him to look old. After a little time pondering this I’ve decided to paint him in a pale desaturated flesh tone. I think an almost human flesh tone will give him an extremely creepy feel. To help create the feeling of great age I’m painting a lot of lines and wrinkles into the texture of his flesh. I’ve also decided to paint his eyes (he has five) as though they are fogged over with cataracts. For my colour palette I’ve used a range of colours that incorporate blue, yellow and red tones alongside neutral and flesh tones. 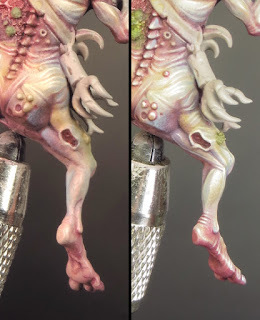 This approach is the same as the one I used for both Akito and the Abyssal Warlord and it’s served me well in achieving realistic pale flesh tones. Realism is going to be a key word in my approach to painting both Horticulous Slimux and his steed Mulch. The sculpt is in a cartoony style and, although I love this, I’ve decided to play against it with my painting style. 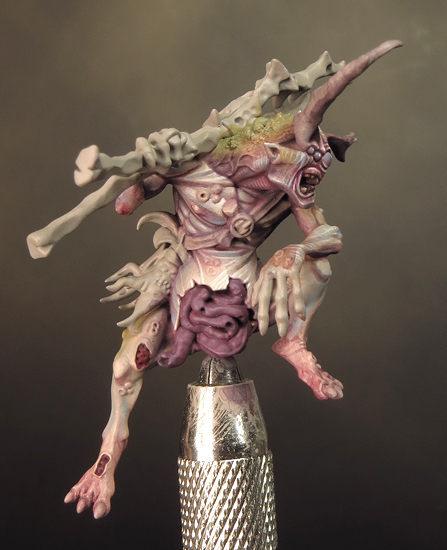 I don’t expect the finished paint job to look ultra naturalistic (he’s a plague demon on a giant demonic snail after all! ); but I think using lots of ‘real world’ reference, and a palette of muted ‘natural’ colours, and will give the finished result something a little extra. I’ve painted quite a few Nurgle minis and I don’t want to fall into the trap of getting too comfortable by simply painting ‘more of the same’! I’m on the lookout to find a new angle and using ‘real world’ reference will help me to do this. I’ve sourced pictures of slugs, snails, frogs and caterpillars. I think they are going to be a great source of inspiration!